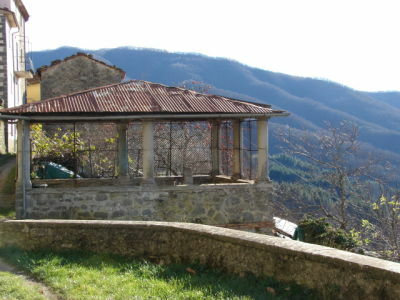 CASA GIANNINI SE ENCUENTRA EN PLENO CORAZÓN DE LA TOSCANA EN UN MARAVILLOSO Y AUTENTICO PUEBLO DE MONTAÑA TRANQUILO LLAMADO CASABASCIANA (QUE CUENTA CON RESTAURANTE, ULTRAMARINOS Y BAR), EN LA LOCALIDAD DE “BAGNI DI LUCCA” Y PROVINCIA DE “LUCCA”. EN “BAGNI DI LUCCA” ENCONTRARÉIS LOS BAÑOS TERMALES Y PISCINAS COMUNALES. CASA DE 4 DORMITORIOS, SALON CON ESTUFA DE LEÑA, COCINA CON CHIMENEA, 2 CUARTOS DE BAÑO Y TAVERNA. ESTA CASA OS PERMITIRÁ VIVIR LAS AUTÉNTICAS EMOCIONES QUE BRINDA UN ENTORNO RURAL. EL PUEBLO DE CASABASCIANA ES UN EXCELENTE PUNTO DE PARTIDA PARA VISITAR LUGARES DE INTERÉS. - 600 M DEL NIVEL DEL MAR, A 6 KM DE BAGNI DI LUCCA (LOCALIDAD TERMAL), A 25 KM DE LA ESTACIÓN DE ESQUÍ DE L’ABETONE, A 30 KM DE LUCCA, A 40 KM DEL MAR DE LA VERSILIA, A 60 KM DE PISA Y A 80 DE FLORENCIA. - A 60 KM DE PISA Y A 80 DE FLORENCIA.